I already knew Wolfram|Alpha could do some cool astronomy calculations, like comparing the escape velocities of the Galilean moons. 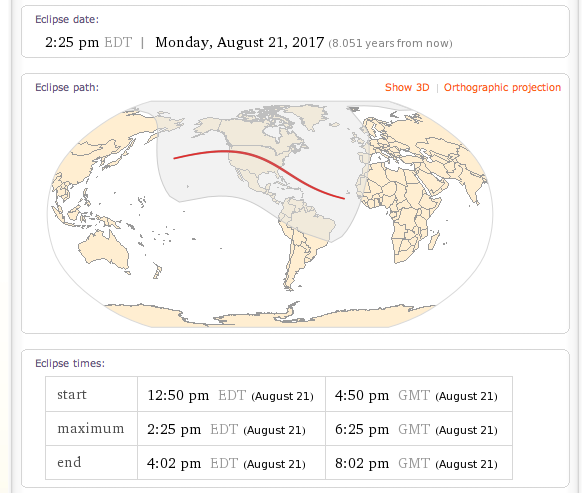 A recent W|A blog post also pointed out that you can calculate the next lunar eclipse. So I tried to see when the next solar eclipse would be for my area and it came up with a partial solar eclipse in 2014. Skip that and go to the next and it turns out there’s going to be a decent one in 2017. As a reminder, I sent an email to myself via FutureMe. It’ll be interesting to see if a) I’m still using gmail in 8 years, b) if FutureMe is still around sending emails, and c) if we can still see the sun. Man, I love W|A.